The Task of the allies is to retreat in good order. The small stream in the south is fordable. Every unit with less than 3 hits marching over point A (or around 20cm) gives the French Player 1 Point. Every unit with 3 or 4 hits gives 1/2 Points. The French win with 6 Points, but feel free to change victory conditions. Retreating with 5-4 Points means a draw. The elector of Bavaria has a lot of Problems. First his hessian and Palatinate allies are'nt reliable. So after the loss of Vilshofen he has to begin negotiations with the austrians at Füssen. His army is near a final Desaster without Money to buy Food or pay soldiers. So desertion is normal. General Ségur learns of the full retreat of his allies to late. In his view he will blame later the bavarian peace-party and especially FM Seckendorff. At Pfaffenhofen the austrian avantgarde under command of FML Mercy starts a serious attack. There's a good Chance for the austrians to make the complete army under Ségur prisoner of war! The scenario is situated in the moment after the loss of Pfaffenhofen to the small austrian avantgarde 200 dragoons strong. 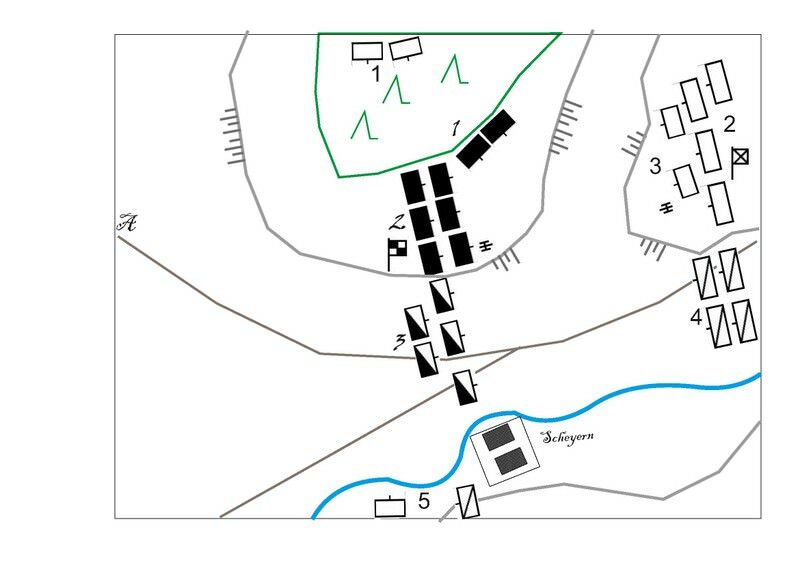 Ségur organize to creat a defensive Position (one of 3 defensive positions in this battle, which was more a chase than a real battle). The map follows a contemporary plan by the French. There are a lot of uncertainties about this decesive battle of the war in Bavaria. The table is around 2,40mx1,80m, so it's for 28 or 24mm figures. The hills are gentle, the stream is fordable. damnitz, there are two artillery bases shown for each side. What weight? Good scenario. Should be difficult for the allies due to the Dithering commander. Lots of hard choices! I would rate one battery medium and one light on both sides. Ségur lost on his retreat 7 guns (more than half of his artillery - or perhaps half of his art. at least), the war chest of his ally and all his correspondence to the enemy. There were two french foreign infantryunits at least at Pfaffenhofen. One was Royal Suédois and the other Royal Bavière. The later had the honour to save the french war chest. So perhaps you would like to give the french one superior foreign bn.. There are some good facts in the french favor - like they were in the real battle. 1st: the austrians had a very deep formation, 3 lines of infantry deep. Reason was the narrow terrain between the Ilm-river and the wood on the top of the hills on the western side of Pfaffenhofen. 2nd: Ségur maybe was not a very clever general but his defensive positions were all well chosen. If there would not were these light troops under Trips the outflanking of these positions would have been inpossible. 3rd: M.d.C. Rupelmonde saved at least for one time the army from total destruction by rallying the troops in a very critical moment. Rupelmonde himself was killed in this event. I would think that there is a good chance to save at least the second line by defending the crest of the hill with the first line. I'm not sure where the german troops were. Historicaly there were 13 french and 4 allied bn.s. In the beginning the 4bn.s under Zastrow and the palatine cavalry formed the avantgarde with 2 guns. Behind these troops came the other 12 guns, the war chest and the french infantry and cavalry. Nevertheless later in the battle the palatine infantry fled throu the french lines, which happened in one of the most critical moments of the battle when the running soldiers throwed even their weapons and havresacks away! The Palatine army of this time was a very small one. There were 6 regiments with 13 bn.s only. So the 4 bn.s at Pfaffenhofen were a significant part of this army. Although I don't know if there were palatine-cavalryunits on the battlefield, it's interesting to know, that the elector Carl Theodor changed the cavalry extremely in this time (autumn 1744). 3 regiments of dargoons and 1 unit of horse (Leib-Reiter, Hatzfeld, Elliot and Blankenheim) were converted to 1 regiment: "Der Frau Churfürstin Dragoner Leibregiment" (the dragoon lifeguard of the electress). 2 carabiniers-Units and the sqn. of the cercle were converted to a regiment of horse: Graf Elliot de Morhange Reiter-Regiment (the count Elliot of Morhange regiment of horse). There were 1 company of hussars (53 men) not included in these regiments. These hussars were typical for german minor states and not used for war but as couriers or for representation. I read now a account from 1745. There it is clear that the 8 batallions mentioned in the austrian book from 1901 were a misunderstanding. The austrians had 8 companies of Grenadiers which is plausible because These were perhaps the coys of the 7 bn.s of fusiliers. The account says that there were 2 Feldschlangen (maybe medium art. ), 2 howitzers and 5 Stücke (perhaps light artillery) on the austrian side. Some details are very interesting and - I think so - reliable. Other are completely nonsense. For example that the allies were 4.000 Palatine and 5.000 French strong and that the austrians lost 19 death and 56 wounded only. It's true that the outflanking by von Trips was really important and clever. But on the other hand all accounts mentioned heavy french fire in Pfaffenhofen and after the fall of the town when the austrian Grenadiers attacked the strong French Position on the hill near Pfaffenhofen. So my guess that there were medium and light artillery was right. Please note that I changed the Scenario a bit. Reason is that I hope to play the Scenario in autumn or winter 2016/17. As I halved the number of batallions I decided now to halve the number of grenadiercompanies and artillery too. I thought that a small unit could stand for a Company but now I'm convinced that a ad hoc bn. would be better. So all Grenadiers are represented in 2 ad hoc bn.s perhaps of 2 coy.s each. In this way I will have half of the grenadier units on the table. Although I don't know the exactly which of the Units were absent at Pfaffenhofen, it seems that most of the French troops in Bavaria were at Pfaffenhofen. So all French troops were foreign regiments - perhaps except the hussars. Almost half of the corps of Ségur (6bns) was formed by Royal-Baviere and Royal-Suédois, because both regiments were mentioned in the contemporary accounts about the battle. In fact I have to say, that I have not the right troops for the refight and I have to think about the Quality of the troops. Normaly I rate the foreign infantry superior what would not seem to reflect the real actions of these troops during the battle of Pfaffenhofen. I'm researching now the austrian troops at Pfaffenhofen. Partly to give others the chance to refight with the right troops as they wish. kronoskaf mentions that the Dragoons of the Regiment Batthyányi Dragoons was present at Pfaffenhofen. First of all I'd like to thank you greatly for all the historical research you are doing, I learned a lot from you, especially on WAS topics, I hadn't studied much. The present scenario is very intriguing, I think I'll replay it with the first occasion! I had printed Serbelloni for our last game falsely as "Dependable" and that made the game a lot more interesting because than Batthyàny has to think cautiously where he wants to intrigue his commanders to attack. Pfaffenhofen is surprisingly the most often played scenario I generated. I ask me why and will try to upload again the map.